Chordomas are slow growing, yet aggressive and life-threatening tumors. Outcomes for chordoma patients vary widely and are highly dependent on the course of treatment received and the individual tumor’s behavior. Modern treatment approaches can significantly prolong patient survival, and, with appropriate care, many patients can be cured. Because the course of treatment received is so important for a patient’s outcome, we aim to provide the information patients need to make educated treatment decisions and obtain the best care possible. 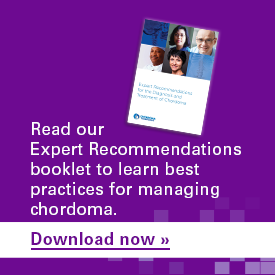 This page summarizes current treatment options available to chordoma patients and lays out points to consider when making treatment decisions. The information provided herein does not replace advice from your doctor. 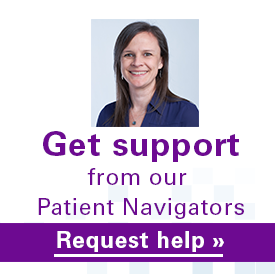 It is important to remember that each patient’s situation is unique and only your doctor can tell you what treatments are right for you. Chordoma is a challenging disease to manage and treatment often involves highly complex procedures that require extensive sub-specialty training and experience to master. Furthermore, treatment of chordoma requires multiple specialists who must communicate and work closely together to coordinate your care. It is therefore very important to find experienced doctors who routinely treat chordoma as part of a multi-disciplinary team. Our Doctor Directory can help you find specialists who are experienced in treating chordoma. It’s always a good idea to consult with multiple qualified doctors for any major medical procedure. Good doctors are not offended by this reasonable step, as second opinions are standard practice, especially for complex diseases like chordoma. For each chordoma patient, there may be multiple viable treatment options, each with different risks and benefits. It is possible, even likely, that different doctors will recommend different approaches. Before making a decision, it is important to understand your options and the consequences of each approach. If you get conflicting recommendations from two specialists, then consider getting a third or fourth opinion. Ultimately, you will have to select the doctor and the approach that you are most comfortable with. The doctor and treatment plan you choose will have a major impact on your outcome. It is therefore important not to rush to a decision without understanding your options. In general, chordomas are slow growing, so, in most cases, patients have time to gather information and seek multiple opinions. Ask your doctors how soon you need to be treated, and do not delay treatment if you are advised it would be unsafe. We recommend that all patients read the National Comprehensive Cancer Network’s guidelines for the diagnosis and treatment of chordoma before planning treatment. You will be asked to create a free account to access the latest version. Surgery is the mainstay of treatment for chordomas. The goal of surgery is to remove as much of the tumor as possible without causing unacceptable harm. For some patients, radiation therapy can reduce the risk of recurrence after surgery and prolong survival. For patients who are not candidates for surgery, radiation therapy is sometimes used as the primary treatment. Chordomas are resistant to radiation, meaning that very high doses of radiation are required to control these tumors. Because of their proximity to vital anatomy such as the brain and spinal cord, which cannot tolerate high doses of radiation, specialized forms of radiation are used to focus radiation on the tumor while avoiding surrounding tissue. Even after surgery and/or radiation, chordomas tend to return in the same location or in the areas around the original tumor. Many patients undergo multiple surgeries over several years to treat these local recurrences. For patients with advanced or inoperable disease, chemotherapy may slow or temporarily stop the progression of the tumor. Because chordomas are slow growing, standard cytotoxic chemotherapy agents that kill fast-growing cells are generally ineffective, however some chordomas patients have been reported to respond to molecularly targeted cancer drugs. There are currently no drugs approved by the FDA to treat chordoma. Regardless of the location of one’s tumor, surgery is required for virtually all chordoma patients. The extent of surgical resection has a major impact on one’s outcome. Complete resection during one’s first surgery offers the best chance of long-term remission and survival. However, because chordomas occur near vital structures such as the spinal cord, brainstem, nerves, and arteries, complete resection is not always possible, or may cause significant loss of quality of life that patients find unacceptable. Having surgery? Learn about our Tumor Donation Program. Below are points to consider regarding surgery for chordomas of the skull base, spine, and sacrum. Surgery for sacral chordomas may involve removal a portion of the sacrum or the entire sacrum depending on the location and size of the tumor. Depending on the extent of the tumor, these procedures may require a combination of surgical approaches to access the tumor from different angles. In order to achieve wide margins, these procedures often involve the intentional sacrifice of sacral nerves, which may result in motor, sensory, sphincter, or sexual dysfunction. The extent of dysfunction depends on which sacral nerves must be sacrificed. In general, the higher the tumor extends in the sacrum, the more sacral nerves must be sacrificed, and the more dysfunction will be experienced. Surgery for spinal chordomas involves removal of one or more vertebral bodies – a procedure called a “spondylectomy.” These procedures often require a combination of surgical approaches (from the front and back), and may need to be carried out in multiple stages. For both spinal and sacral chordomas, mechanical and soft tissue reconstruction are usually required after removal of the tumor and involved vertebral bodies. Due to the complexity of surgery and reconstruction, a multidisciplinary surgical team may be needed, including specialists in surgical oncology, neurosurgery, orthopaedic surgery, vascular surgery, and plastic surgery. This operation should be led by a neurosurgeon or orthopaedic surgeon who specializes in complex spine surgery. Due to the location of skull base tumors within the head, en bloc resection (removing the tumor in one piece) is rarely possible, however gross total resection can be achieved with an intralesional approach. When en-bloc resection or gross total resection is not possible, maximum safe resection is advocated. There are a broad range of surgical approaches available to access skull base chordomas, and staged surgeries combining multiple approaches are often necessary. Selection of the surgical strategy for each patient is highly dependent on the location of the tumor within the skull base, and the surgeon’s preference. For each patient different approaches could have different benefits, and could carry different risks. For some approaches, a neurosurgeon may work in tandem with an otolaryngologist-head and neck surgeon (ear nose and throat [ENT] surgeon). Regardless of the approach, it is important that the surgeon(s) be experienced in skull base surgery, which is a distinct sub-specialty for neurosurgeons and ENT surgeons. Chordomas can only be controlled with very high doses of radiation – doses that would permanently damage normal tissue. Because of their proximity to vital anatomy such as the brain and spinal cord, which cannot tolerate doses of radiation required to kill chordoma, radiotherapy for chordoma must be highly conformal, meaning focused on the tumor while avoiding surrounding tissue. Several different types of conformal radiotherapy are available. A type of radiation called proton beam therapy is most often recommended for chordoma patients because it allows delivery of very high doses of radiation to the tumor while minimizing doses to tissues just millimeters away. Another type of particle beam radiation called carbon ion therapy has similar properties to proton beam therapy, but is only available at a small number of centers. While radiation is usually well tolerated, side effects are possible. For skull base tumors, pituitary dysfunction is common after radiation. Depending on the area radiated, there may also be a risk of damage to the optic nerve, cranial nerves and brain stem, which could cause blindness or paralysis. For tumors of the spine, radiation can also damage to the spinal cord, causing paralysis. Radiation for sacral tumors can cause radiation proctitis, which is damage or inflammation to the colon. If surgery and/or radiation are not possible, systemic therapy can be used to slow progression of the disease. Systemic therapy is the use of treatments that spread throughout the body to kill cancer cells wherever they are located. These treatments are prescribed by a medical oncologist, and sometimes by a neuro-oncologist. Systemic therapy includes different types of drugs and therapies, including cytotoxic chemotherapy drugs, targeted therapies, and immunotherapies. Because chordomas tend to be slow growing, they are generally resistant to conventional cytotoxic chemotherapy drugs, which target rapidly dividing cells. For this reason, targeted therapies and immunotherapies are most often used for chordoma treatment. Learn more about these options for chordoma in this systemic therapy table. More information about the genes, proteins, and signaling pathways that are important in chordoma and may be promising targets for systemic therapies can be found in our Therapeutic Target Dashboard. Clinical trials are important treatment options for any cancer patient to consider. For chordoma patients, some clinical trials may provide an opportunity to receive new, experimental therapies that could be more effective than currently available options. Clinical trials may also provide an opportunity for patients to gain access to clinically available therapies at no cost. In addition, chordoma patients who participate in clinical trials contribute to knowledge that can guide therapy for future patients and potentially help identify new ways of treating this rare cancer. The Chordoma Foundation’s Medical Advisory Board (MAB) recommends that all patients with recurrent or advanced chordoma consult with their medical team—including an experienced chordoma medical oncologist—about participating in a clinical trial. This can help you determine which trial might be the best option for you based on your medical history and current situation. More information about clinical trials and a list of clinical trials open to chordoma patients is available in our Clinical Trials Catalogue. Increasingly, oncologists are attempting to customize therapies to the unique biology of each patient’s individual tumor (“personalized medicine”) in the hope that the treatments will be more effective and have fewer side effects. Your doctor may perform tests on your tumor to determine which targeted therapies make the most sense for you. In addition, a number of companies offer tumor-profiling services intended to help inform a rational decision about targeted therapies, however, the utility of these services is unproven. The information provided herein is not intended to be a substitute for professional medical advice, diagnosis, or treatment. Always seek the advice of your physician with any questions you have regarding your medical care. Never disregard professional medical advice or delay in seeking it because of something you have read on this Website.